Everyone loves Fiona in her human form because she's pretty. While I do think she's very pretty, I prefer her ogre form. Why? Well, in Shrek 1, she is much too obsessed with being rescued by her true love and hates being a horrible, ugly beast. Seventeen years ago I thought Shrek 1 Fiona was the best thing to come down the pike. But then Shrek 4 came out, and blew my mind! She had changed so much. She didn't care about true love; in fact she called it a fairytale. 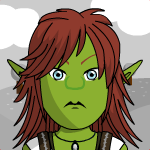 And, she hid her human form instead; starting a cause in an effort to save all ogres. I found the new take on her character to be much more meaningful. It added so much depth and purpose. I like to think I grew up a lot in those seventeen years. Fiona doesn't even know her rescuer's name and wants to kiss him, and that's just too Disney. In retrospect I find her in Shrek 1 to be a shallow, easy woman. Like Anna, Rapunzel, basically every Disney character introduced since the dawn of time. My favorite ogre warrior moments are, well, all of them. To be completely honest I have all of her lines of Shrek 1, 2, and 4 completely memorized. (I don't really watch Shrek The Third; it was a fiasco.) But definitely by far, ogre warrior Fiona is one of my top three favorites. I cannot get enough of her. I recently watched Shrek 4 three times in one week; and no, I didn't get tired of it. Fan of Shrek since its original release in 2001, and going strong.